1861 to 1865 raged one of the most brutal wars in our History. It faced of Neighbor against Neighbor and Brother against Brother. It was a war that would see and end to Slavery and Yankees united with Rebels to become one Nation. America. Above are Generals Grant (in dark blue) and Lee (in gray). Today we celebrate that time as a hard and sad time, but also a time that remembers Heroism, Romance and in it's end, a country reborn. The Civil Wars Soldier Uniform is worn to honor an ancestor who fought valiantly for his beliefs, not only by dressing the part, but also by joining in a re-enactment of a particular battle as are held in famous battle sites on the dates they actually happened. If you are a Lady on the other hand, you may want to be in a Southern Belle Gown to dance at your soldiers side at the next Southern Ball, usually held around the time of an historical battle or event... but sometimes JUST because it's time for people to get together, get handsome or beautiful, and dance Old Ballroom style. Children are welcome to dress in traditional Civil War Period Costumes also. The children of the Civil War didn't have it easy. They did what they could to help by the time they reached a double digit age of 10 or 11, many male children went to war. There they drummed out orders or tended the wounded. They basically did many of the smaller jobs while their fathers did the actual fighting. Girl children acted as nurses or stayed home and sewed their little fingers to the bone making shirts and blankets for the soldiers. Your children would probably enjoy dressing for the Civil War Period and it would be a wonderful opportunity for learning the History of the South... and ultimately America. If it is "authenticity" you are striving for I might suggest that you make your own Uniforms and/or Ball Gowns, etc. If that is not an option then there ARE some "costumes" of pretty good quality to which you can ADD your own finishing touches to make the costume more authentic and to your liking. Here(pics just below) at Frank Bees, for example, there are several acceptable, but possibly not EXACT, Civil War Period Costumes to choose from. Through this website I hope you will find ALL of your Civil War Costume needs. Some people prefer to make their own clothing in this case, as they are working off of pictures of anchestors and have taken on a great burden in being as accurate as possible. I respect this TOTALLY and I can tell you where to find Fabric, Patterns, and other Sewing Materials to make the Civil War Costume that you are aiming at. During the Civil War, regretably it being such a violent time, many types of Weaponry were used. From Rifles to Pistols to Swords to Cannons.. they were all there. To complete your costume or "uniform" (may be a better word in this case)... You may require an authentic Weapon... On the other hand a REPLICA may do just as well. 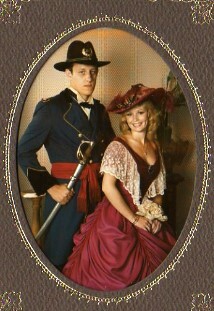 At NetLink Enteprises, Inc. you will find many MANY Replicas from the Civil War Period. There are Caps, Hats, Gloves, Gauntlets (US Civil War OFFICERS Gloves), Sword Belts, Rifles, Pistols, and Swords. There are Wooden Canteens from the Civil War and even an Officers Spurs Replicas. There are Miniature Cannons and larger ones too. When I happened upon this place I was very pleasantly suprised at their range of time periods and types of replicas. I found it a facinating place to visit. I hope you do too. And I HOPE you find every thing you need there! Isn't internet shopping a wonderful thing? One never even has to leave the house...EXCEPT, of course, when it's time to step out as a beautifully gowned Southern Belle. It has occured to me that one way to "prepare", as in gathering costume ideas, or simply getting in the mood for your Civil War adventure, whatever that may be, might be to watch a few MOVIES on the subject. The first one that comes to mind of course is the Classic "Gone with the Wind". It is a movie RICH with Costume ideas. Then there are the morefactual movies also.. some that I will list here. Civil War Events are more popular than one might think. There are Weekend (or longer) Encampments and Famous Battle Re-enactments. There are Grand Civil War Balls and Festivals. Check with the online Events Locator in the "EVENTS" section here in the Historical Costumes category to find out what's going on in or near your area. I wish you and yours a very fulfilling and educational experience.